Read Part I (Sahel Region) and Part II (West Africa) of the series. Morocco is defined in positive light by General Waldhauser, as it has the ability to “operate and maintain advanced U.S. equipment” and seeks to “increase interoperability with U.S. and NATO forces.” It’s geographical location largely contributes to this, as it is on the Northwest coast of Africa, it borders the Mediterranean Sea, and it is close to Western Europe. According to AFRICOM, Morocco has been a common destination of U.S. Navy for joint practices and exercises. 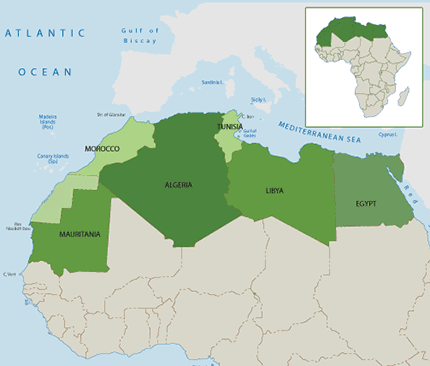 Regarding Tunisia and Algeria, the common theme is the threat of Libya, which borders both countries. The U.S. considers Algeria a “highly capable partner in North Africa,” as it has significant counterterrorism programs against extremist groups, according to AFRICOM. General Waldhauser did not mention any sort of presence of U.S. troops in Algeria, yet reports have shown the deployment of troops in Algeria following the deaths of four U.S. soldiers in Niger last year. Also, it is important to note that in terms of military strength, Algeria is the 2nd most powerful country in Africa. Tunisia plays an even bigger role in counterterrorism and border security with Libya. The U.S. has provided Tunisia with funding for its border security projects, which is set to “provide fixed radar and camera coverage of the Tunisia-Libya border in November 2018.” General Waldhauser also claimed that the U.S. has “trained and equipped special operations forces.” Again, there is no declaration of any sort of base or number of U.S. troops in Tunisia. This is worrisome, considering that the Tunisian Special Forces have begun to engage in attacks against terrorists—and since we trained these forces, how can we be sure that U.S. forces aren’t involved in these exercises? The short answer is that we can only know if the military leaders tell the American people the truth. Another story such as the death of four U.S. soldiers in Niger last year is not the way the public and other branches of government should have to find out about U.S. troops presence anywhere. Without dwelling on the prior U.S. intervention in Libya in 2011, the U.S. currently plays a quiet but important role in the country. While UN initiatives are aimed at the continuation of the political reconciliation and stability process in Libya, the U.S. AFRICOM has two primarily military objectives: to degrade terrorist groups who threaten U.S. interests and threaten to destabilize Libya and the region, and to avert civil war. ISIS-Libya, al-Qaeda, and other extremist groups are currently dispersed throughout Libya, which contribute to the unstable and divided political and militaristic climate. There is no question that the U.S. (not just AFRICOM) is deeply concerned with the risk of full-scale civil war in Libya. Though Libya is another African country where the U.S. does not have any official military base (particularly since the closing of the Benghazi diplomatic compound after the 2012 attack) in or stated number of troops in, it is clear that it is an extremely important aspect of U.S. involvement in Africa. There are spontaneous air strikes in the country as well, reported by AFRICOM. One important North African country that General Waldhauser refrained from mentioning is Egypt. There are no official reports, bases, or operations of U.S. military activity in Egypt. However, the U.S. Army National Guard recently deployed 200 soldiers to Sinai, Egypt, to assist the Multinational Force and Observers, the peacekeeping force which oversees the terms of the Egypt-Israel peace treaty. Also, Egypt receives the fourth most amount of military aid from the U.S., behind Iraq, Afghanistan, and Israel. Egypt also has the strongest military on the African continent.